What are the best methods for managing medications? Discover the tips you need now. Managing medications becomes more of a challenge as patients get older and face more complex health conditions. A recent surgical patient with an underlying health condition can have six or more prescriptions to keep track of every day. Making sure a patient takes the appropriate pills at the appropriate times is a stressor for many caregivers, but sometimes the problem begins with the prescription. As more doctors join large practices, patients run a greater risk of having to meet with a new provider each time they need medical care. This raises the risks of medication mix-ups, including misdiagnosing side-effects as new disorders or overprescribing medication. Have a complete copy of a patient’s medical history and a complete medication profile. This should be a complete picture, including over-the-counter meds and any alcohol or illegal drug use. Pharmacists play an important role in medication management, which is why it’s important to stick with one pharmacy when possible. Taking that single step goes a long way to prevent polypharmacy all by itself. Those at greatest risk for polypharmacy are elderly patients moving from a care facility to a home care environment and patients who are returning home after surgery. The elderly often take on both roles at the same time, which places them at particular risk. Add in the ageism that contributes to under- or uneducated patient status and the cognitive problems suffered by some patients, and you wind up with a perfect storm for confusion. 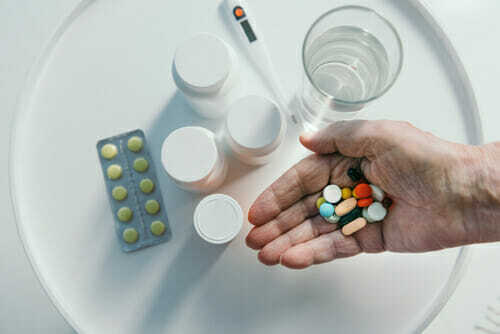 Reconciling medications – comparing medical orders to prescriptions – not only uncovers duplicate prescriptions but also uncovers mistakes in dosage or in basic prescription filling. We all remember the scene in It’s a Wonderful Life when a young, brave George Bailey stopped Mr. Gower from giving a patient the wrong medication. Pharmacies aren’t allowed to employ 12-year-olds anymore for good reason. Finally, reconciling medication gives a medical team an opportunity to consider alternative medications which might differ in price but be less problematic. If a patient opted for a cheaper drug early on but had to add two or three more medications to manage side effects, the original, more expensive option would reduce symptoms while also lowering costs. Medicine cabinets are one of these least effective ways of managing prescriptions and are often the first places hit by burglars. Should someone break into your home, you could wind up losing hundreds of dollars of essential drugs. Know where they rarely check? The bathroom or hallway closet. Coincidentally, organizing medical supplies is much easier when you have a larger space to deal with, so smart caregivers tackle this task right away. It’s imperative that you count the pills in every prescription bottle and keep a chart of what is there. Stealing medication is very common. Thieves don’t have to break in during the middle of the night. They can be a next-door neighbor who regularly pops in for coffee – and the occasional tab of OxyContin. An added bonus, of course, is you catch miscounts quickly enough to do something about them. As noted earlier, pharmacies do sometimes make mistakes. Gather all of the medical supplies you use for managing health problems, from Band-Aids and burn cream to over-the-counter allergy relief. Split them into groups by symptom – e.g. “first aid,” “stomach aches,” “colds” – and place them together in labeled containers. This allows you to quickly find anything you need at the moment. It will also help keep your medical supply area tidy when it comes time to organize pills. Patients over age 65 can often take 14 – 18 prescriptions per day. There’s no wonder people need help managing their pills or that 28% of hospital stays are due to polypharmacy. Some elderly people do fine enough managing their meds on their own, but for those who need help, having a routine is essential. Too many caregivers leave pills out in plain sight, inviting break-ins and other problems into their loved one’s lives. An organizational system should be easy to use and convenient to store. They should also make it easy to remember their dosing schedule. For complicated prescription management, there are robust systems fit with digital alarms and large, easy-to-handle containers. The biggest systems offer up to a month of planning and four different containers per day for morning, noon, evening and night scheduling. All someone has to do is invest a few minutes a week or month in placing pills in the appropriate containers and setting alarm reminders. But organizers run the gamut. There are much simpler systems available that will ensure a patient neither misses a dose nor takes too many at once. Preventing polypharmacy will become more of an issue as our current population ages and requires more medicinal help to stay healthy. Get ahead of the problem early by creating a system that works. If you need help managing medications for a loved one in the Phoenix area, Celestial Care can help. Get in touch with our caring team today at 602-375-8880.